Odds On Evil is one of the most popular episodes from season one for spy fans, because the story closely resembles Ian Fleming’s novel Casino Royale. But rather than relying on card sense, the IMF team rely on gadgets and card tricks to break the villain’s bank. The episode opens with IMF leader, Dan Briggs (Steven Hill) toying around in an amusement arcade. He is taken out the back by the proprietor and lead to an old moviola and then left alone. Briggs brings his eyes to the viewer and is given the details of the new mission. After the briefing, the message, naturally, self destructs. The IMF Team’s mission is to take down Prince Iben Kostas (Nehemiah Persoff), the leader of an un-named European country. Kostas intends to declare war on a neighbouring oil rich country. To do this, he has ordered 1.5 million dollars worth of weapons from arms dealer Oliver Borgman (Vincent Van Lynn). The weapons are on their way by ship, and Kostas has agreed to pay for them on delivery. Kostas, apart from being his countries leader also runs the countries casino. The IMF intend to obtain the money that Kostas intends to pay for the arms shipment, by breaking the bank at Kostas’ casino. The team selected for this mission are IMF electronics wizard, Barney Collier (Greg Morris), who set about putting together some gadgets that can help the team in it’s quest. Next is Rollin Hand (Martin Landau), the teams master of disguise and deception. In preparation, he works on his card handling skills and sleight-of-hand. Willy Armitage (Peter Lupus) is the muscle of the group, and Cinnamon Carter (Barbara Bain) is the beauty. The special guest agent is Andre Malif (Nico Mindaros). When they get to Kostas’ country, Cinnamon immediately makes contact with the Prince. She pretends to be a rich married woman. Andre plays her long suffering husband. Despite being ‘married’ she still throws herself at the Prince. To get revenge, Andre attempts to break the bank by playing roulette. Naturally he has a little help from one of Barney’s gadgets. Standing close by is Willy Armitage who has a ninety pound computer is hidden in the lining of his suit. This computer can work out where the ball will stop on the roulette wheel. Then the number pops up on the dial of Andre’s watch. Andre quickly amasses a small fortune as the Prince watches on. As Andre passes the $150,000 mark, the Prince shuts down the table. But Andre isn’t smart enough to take his winnings and go. No, he has to attempt to win more – this time at the Baccarat table. But Andre’s luck doesn’t hold out. He loses all his winnings to another card player; Rollin Hand. Andre walks away dejected and defeated. After his win, Rollin is looking to call it a night too. But Kostas sees Rollin as any easy mark, and that he can win the casinos money back. Everyone seems like an easy mark to Kostas, because he has marked all the casino’s playing cards and wears special contact lenses to read them. But what he doesn’t know is that Rollin has worked out Kostas’ system and is wearing contact lenses too. One aspect of the 2006 Casino Royale movie that I was disappointed in, was that the film-makers changed the card game in the story, from Baccarat to Texas Hold ‘em Poker. The reason given for this was that they believed that Baccarat was too complicated and the viewing audience would not understand it. One of the joys of Odds On Evil is that Kostas gives Cinnamon a minute long lesson in Baccarat. It’s clear and concise and drives the story along. Even those unfamiliar with the game will understand what is happening on the screen. It’s a shame that the Bond film felt the need to dumb down for it’s audience, whereas Mission: Impossible educated their audience instead. Apart from the card game, the other Bondian touch to Odds On Evil is the car that the IMF team choose to make their escape in. As you’ve no doubt guessed, it’s an Aston Martin DB5. As this is a season one episode, it has Steven Hill and the team leader, rather than Peter Graves. Graves is so indelibly linked with this show, when going back and looking at the earlier episodes, it sometimes seems rather strange that he isn’t there. 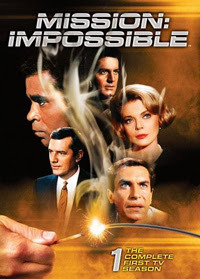 But in the end Odds On Evil is a great example of the Mission: Impossible formula, and one that should be of interest to spy fans in general.